Everyone at Musa Masala wishes you all a Happy Losar, the Tibetan New Year. This year, the year of the dog, starts on February 16th. Ang Diku Sherpa has written a great quick overview of Gyalpo Losar, the Sherpa celebration of the New Year. We are also celebrating the upcoming art show and sale at the Wilderness Medical Society’s Winter Conference in Lake Tahoe. On February 24th, Musa Masala will be showcasing amazing artists, writers and photographers who have all donated their work to fundraise for the Wongchu Sherpa Memorial Hospital. 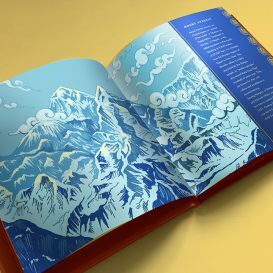 In this post, we are introducing an illustration from our upcoming book, Musa Masala: Mountain Girl of the Himalayas. 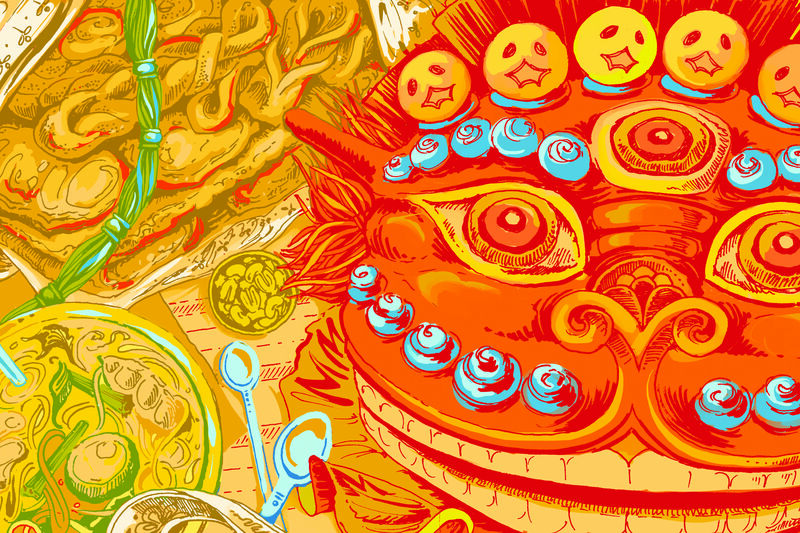 Fittingly, it is a panel from the book where Musa attends a Losar celebration as only Musa can! You’ll have to wait for the book to learn more. This beautiful book is illustrated by Julie Ramirez from RBMM in Dallas, Texas, Julie and some other talented artists from RBMM will be on display at the art show. Next week we will share more about our latest fundraiser, but for now, thank you, Ang Diku Sherpa, and Happy Losar, Tashi Delek! I am Ang Diku Sherpa. 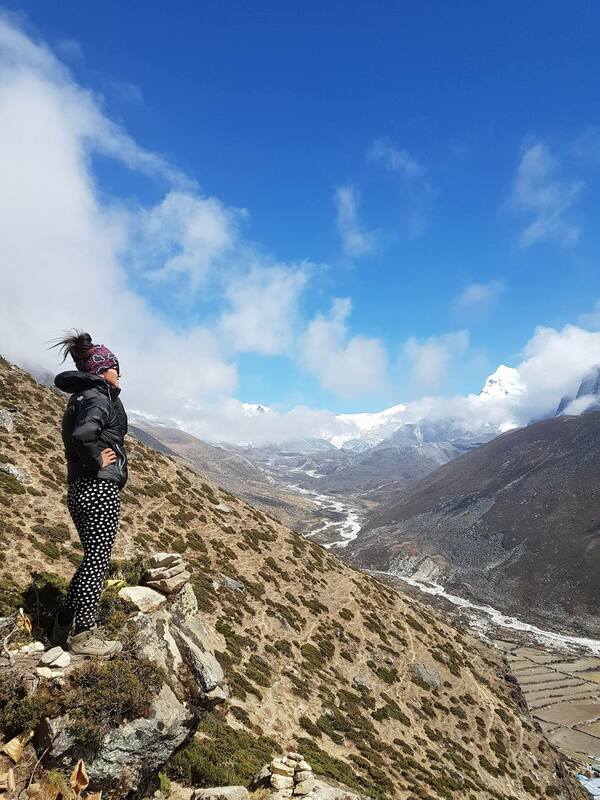 Here in this photo I am standing at a mountain pass similar to what the Sherpa people, the “People from the East,” came over when traveling from Tibet into Nepal, bringing their traditions and religion. Losar, the celebration of the Tibetan New Year, is an important celebration in Tibetan Buddhism. The first day of Losar varies each year and it derives from the Chinese lunar calendar. There are three versions of Losar celebrated in Nepal: Tamu Losar, Sonam Losar, and Gyalpo Losar. Gyalpo is most celebrated by the Sherpa people, so we will concentrate on that. Gyalpo Losar is celebrated for two weeks, during this time the people sing, dance and eat special foods and attend special ceremonies at the Gompa, or monastery. The main festival is celebrated in the first three days. On the first day, they clean the house and share a special beverage called Changkol. Changkol is derived from Chhaang, or Tibetan beer. When the clock strikes midnight, the traditional greeting of “Tashi Delek,” meaning “blessings and good luck,” is shared and friends and family stay up late to welcome the new year. In the morning, many Sherpa change out the Dhoja, or prayer flags, symbolizing the fresh start of the new year. The Lhosar cookie, the khapsay, is an absolute requirement for the proper celebration of the new year. Khapsays are made for other formal celebrations, too, like marriages, the enthronement of a lama and so on, but the new year is when the khapsay comes into its own. Probably the most well known khapsay is the bhungue amcho (Donkey Ears). The Khapsay is made with plain dough flavored with salt and sugar, butter and milk and deep fried in mustard oil. Gutung is a noodle soup that is unique to Losar. It’s made with meat, sweet potato, wheat, rice, cheese, peas, green pepper, radish and vermicelli noodles. The word “gu” means nine, while “thuk” refers to noodles soups, as in thukpa. Two days before the Losar, everyone in a Sherpa family gathers to enjoy Gutung. Prepared with a combination of nine different kinds of beans, tradition states that each member in the family should have nine bowls of this soup. Gutung is also served with a special type of dumpling, which contains different hidden objects used in the place of fillings. The hidden items are often strange, such as wood, salt or even coal and are jokingly meant to relate to the character of the person they are chosen for. 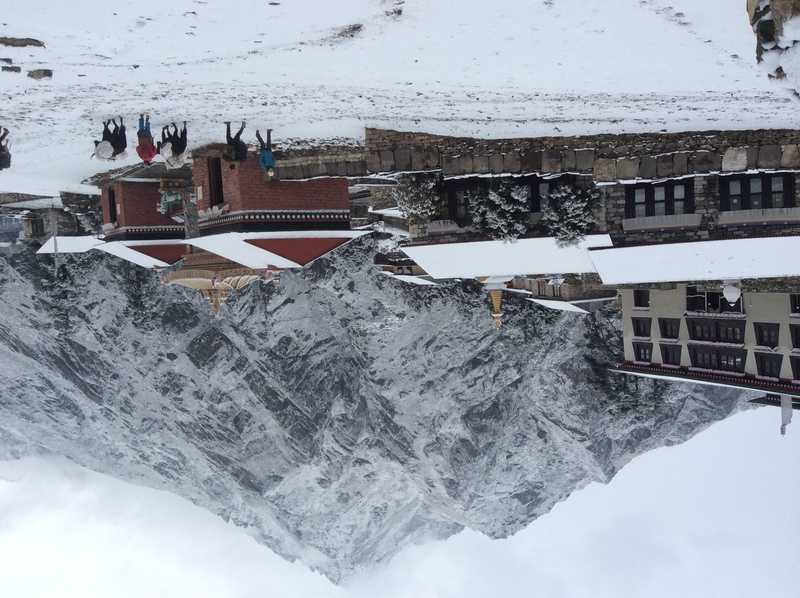 Here is the Tengboche Monastery. Monasteries play an important part in the Losar celebration, and Tengboche is one of the most important for the Sherpa people. Here there will be celebrations, chanting and singing to bring in the new year. On the main New Year’s Day, called Gyalpo Losar, the people wear traditional clothes, go to the monasteries and give donations to the monks. Torches are passed amongst the crowd and a dance depicting a battle between the king and a deer and between gods and spirits are performed. From here on, it is a celebration of the coming year with more feasting, fireworks and dancing. Losar is coming and we wish you all a Happy New Year, Tashi Delek! !